Book hotel rooms online with us at Longevity Wellness Resort Monchique Hotel at the lowest rate, guaranteed. 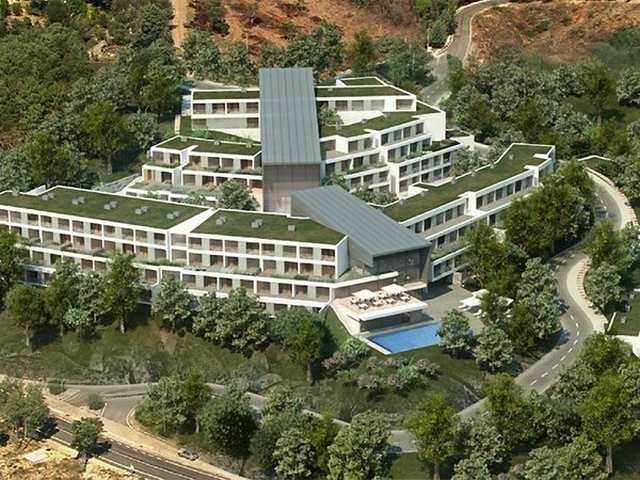 Get a holiday discount room rate at the modern 5 Star Longevity Wellness Resort Monchique is located in Caldas da Monchique on the Foia mountain looking south to the sea over the plain of the Algarve. The hotel has 135 modern holiday suites providing accommodation for two adults and a family room for two adults and two children. The Longevity Wellness Resort Monchique spacious suites are equipped with balconies or terraces, self-catering kitchenettes, satellite TV, Pay TV, radio, direct dial phones, free internet cable access, safe, mini-bar and a hairdryer in the bathroom. The hotel faces the sea with a garden promontory jutting out into the sea providing wonderful views. Longevity Wellness Resort Monchique in the Algarve is a fusion of luxurious holiday resort and cutting-edge medical spa. Here the concept of well-being is comprehensive and can be experienced in the hotel architecture, minimalistic in design and decor, natural lighting, open spaces, use of Monchique thermal water, pure fresh air, savoury and healthy gourmet cuisine and the genuinely caring professional staff. It is the first truly Medical Spa Resort in Portugal. A gourmet cuisine is to be found in the restaurant which is also shaped to meet treatment requirements. There is a outdoor pools and an indoor pool, games room, cinema room, a multi-purpose room and underground free parking. Free Wi-Fi in public areas.